Today I’m offering this Spooky Vintage Casket Image! Featured above is a Wooden Casket with Metal Handles on it. I thought this was awfully creepy looking and could work well in your Halloween or Gothic Style projects! This is another image scanned from a very rare printer’s book in my collection! There’s no date in the book, but my best guess would be that it’s from around the 1880′s. 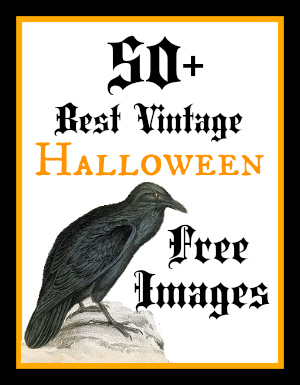 If you need more Halloween Images for your projects, be sure and check out the 50 Best Free Vintage Halloween Images post, you can find that one HERE. 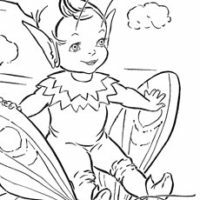 Adorable Fairy Coloring Page Printable! 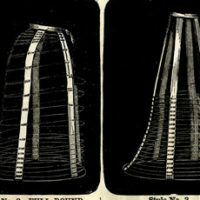 Four Vintage Wire Hoop Cage Skirt Diagram Graphic! Christmas Bell Image! « Santa Pillow Box Printable! Hello! This is sooooooo AWESOME! Been having a hard time finding good images of coffins for the Halloween season. So appreciate what you and your team do. You are so amazingly generous and have inspired me to go back into my arts and crafts. THANK YOU!